Abstract: The Mabel H. Brooks photograph collection consists of 220 photographs of Austin, Texas and the surrounding area, made between 1866 and 1920 by various photographers. The images were collected by Mabel Houghton Brooks and arranged into five scrapbooks. Samuel B. Hill, Hamilton Biscoe Hillyer, and William James Oliphant are the principal creators of the images, while some of the photographers are unknown. A description of original records referenced in this finding aid is available at http://www.lib.utexas.edu/taro/tslac/50107/tsl-50107.html. These photographs were originally mounted within five scrapbooks but were removed because of preservation concerns. The prints have been numbered serially and remain in the original order in which they were arranged within the scrapbooks. The image descriptions have been adapted from the notes on the back of the prints. When known, the name of the photographer follows the title of the image. Duplicate images appear in the collection and have been noted within brackets. Click here to access a full inventory of the photographs. Please see the finding aid on TARO (http://www.lib.utexas.edu/taro/tslac/50107/tsl-50107.html) for details on how to access paper-based materials. Mabel Houghton Brooks was born on April 29, 1876 in Greenville, Alabama. She moved to Austin, Texas in 1880. She received her bachelor of literature in 1898 and her master of arts degree in philosophy in 1901 from the University of Texas. In 1908 she was vice president of the University of Texas Alumni Association. Brooks was also a painter and commercial artist, training at the National Academy of Design and the Art Institute of Chicago and exhibiting her work at the Art Students League and at the Annual Exhibition by Texas Artists at the Fort Worth Art Museum in 1922 and 1923. She began working at the Texas State Library in April 1921 as the loan assistant and assistant cataloguer. In the 1920s, she is credited with finding the original glass plate negatives taken by George Robertson for William James Oliphant during a buffalo hunt in Buffalo Gap, Taylor County in 1874. She died in San Antonio, Texas on May 29, 1929. 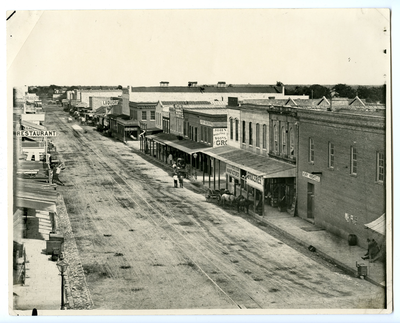 The Mabel H. Brooks photograph collection consists of 220 photographs of Austin, Texas and the surrounding area, made between 1866 and 1920 by various local photographers. The images were collected by Mabel Houghton Brooks and arranged into five scrapbooks. Samuel B. Hill, Hamilton Biscoe Hillyer, and William James Oliphant are the principal creators of the images, while some of the photographers are unknown. The majority of the images are of the State Capitol building, Congress Avenue, the Colorado River, and Barton Creek, in addition to images of local Austin businesses, churches, and individual family homes such as Pease Mansion and the Governor’s Mansion. Also included are images of local landmarks such as the French Embassy, the Texas State Lunatic Asylum (now known as the Austin State Hospital), the Deaf and Dumb Institution (now known as the Texas School for the Deaf) and the Texas Military Institute. There are a series of images taken during the 1869 flood in Austin, along with an additional set of images documenting the construction and destruction of the first dam on Lake McDonald in 1900. 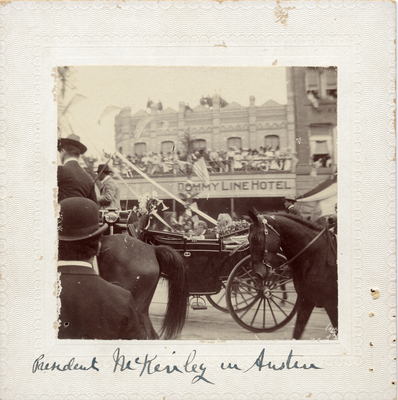 Four images document President McKinley’s visit to Austin in May 1901, showing the parade up Congress Avenue and a decorated welcome arch. Additional images show employees posing inside local businesses, including the Austin Statesman newspaper office, a city book store, and a dry goods store. The majority of the images are copy photographs and vary in size from 3 1/2 x 3 1/2 in. prints to larger 8 x 10 in. prints. For physical materials: Materials do not circulate, but may be used in the State Archives search room. Materials will be retrieved from and returned to storage areas by staff members. Under the Copyright Act of 1976 as amended in 1998, unpublished manuscripts are protected at a minimum through December 31, 2002 or 70 years after the author’s death. The term of copyright for published material varies. Researchers are responsible for complying with U.S. Copyright Law (Title 17 U.S.C.). For physical materials: Researchers are required to wear gloves provided by the Archives when reviewing photographic materials. Hubert Jones Glass Plate Negative Collection, 1870-1900, 7 linear ft.
Lawrence T. Jones III Texas Photography Collection, ca. 1846-1945, 27 linear ft.
(Identify the item), Mabel H. Brooks photograph collection. 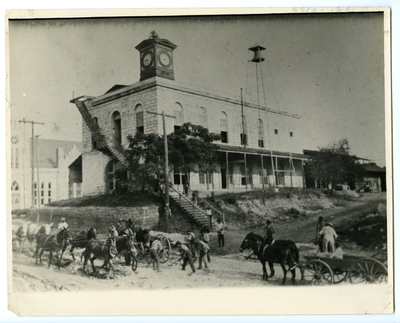 Archives and Information Services Division, Texas State Library and Archives Commission. This collection was donated to the Texas State Library by Richard S. Brooks in 1932. Preliminary inventory and notes by John Anderson, December 1983. Additional processing and EAD finding aid prepared by Halley Grogan, May 2013.